EUROCAE & the European Cockpit Association (ECA) mark the start of a closer partnership with the signature of a new Memorandum of Understanding. On 28 of April 2017 the organisations agreed on reinforced cooperation on the development of industry standards for better & safer aviation. ECA represents over 38.000 professional pilots in Europe and has long established itself as the active voice of pilots speaking with the European Institutions, such as the European Aviation Safety Agency (EASA), the European Commission, the European Parliament and the Council of Ministers, as well as EUROCONTROL, the European Civil Aviation Conference (ECAC) and the SESAR Joint Undertaking. Its expertise has already made it a key contributor to various work streams at EUROCAE, ranging from ATM, avionics, safety devices, airports to RPAS. This reinforced partnership between EUROCAE and ECA will bring added value for both organisations and industry overall. The MoU provides a basis for facilitating the exchange of general and technical information, sharing expertise and best practices, ensuring cross-participation in working groups where appropriate and developing joint positions or recommendations to third parties on certain topics. “We share a long history of working with EUROCAE, we share the same safety-oriented goals and objectives”, says Jon Horne, ECA Vice-President. “The right, commonly understood technical standards are critical to aviation safety, and this is why we are very happy as a profession to be fully engaged and partnered with EUROCAE”. EUROCAE President, Francis Schubert mentioned that a new collaboration always brings new opportunities for both partners and ECA has proven over the years its active involvement in different developments steaming to ensure a high level of aviation safety based upon harmonised rules throughout Europe and globally. EUROCAE shares the same vision and is looking forward to a constructive cooperation for the benefit of the aviation industry. 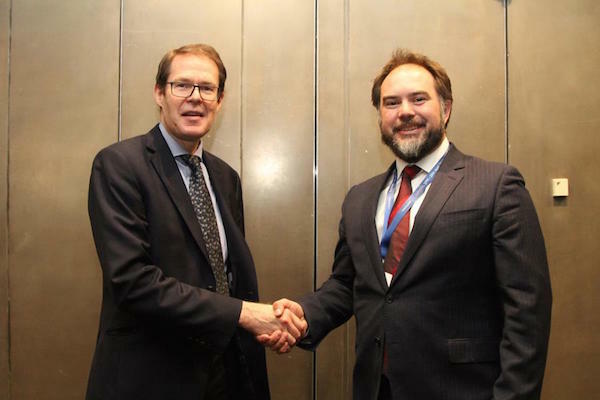 Christian Schleifer, EUROCAE Secretary General and Jon Horne, ECA Vice-President committed to actively cooperate within the framework of the MoU and to effectively use all the available resources to the benefit of the industry.